K and I spent a very pleasant day. 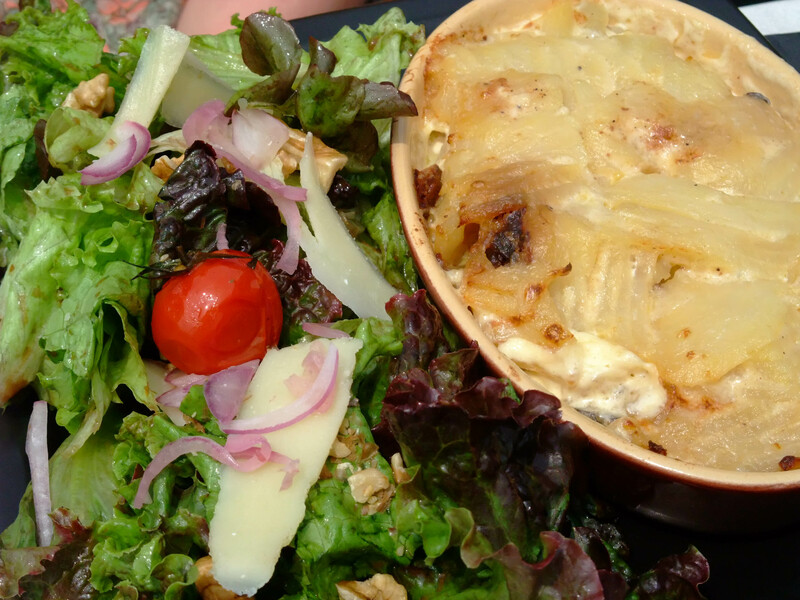 After shopping for some much needed shorts for K, we went to do some web work in Le 5 and found an excuse to eat Gratin Dauphinois – the famous potato dish that comes from this region. It was delicious – Le 5 make it simply and wonderfully. They served it with a generous salad and the ubiquitous bread. We passed a good four hours in the restaurant and divided our time between the outside terrace and the inside warmth. The sky has clouded over today and it feels like rain. We’ve just come back from a walk around the centre of Grenoble – a somewhat depressing place to be. It’s full of people and places to sit but isn’t the most desirable of cities to hang out in. I should imagine sitting up at the Bastille looking down would be nice but I’m way to lazy to walk up the hill in the dark and a bit too scared to go up in the cable cars. This entry was posted Saturday, July 17th, 2010 at 9:57 pm	and is filed under Places to eat, Travelling. You can leave a response, or trackback from your own site.